Cats are at the heart of everything we do. 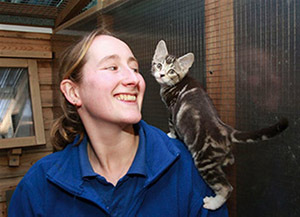 Each year Cats Protection helps around 200,000 cats through our national network of over 250 volunteer-run branches and 32 centres. We educate people of all ages about cats and provide an array of cat care information via our publications, websites, social media and national Helpline. We promote the importance of neutering to prevent unwanted litters from being born and becoming the abandoned cats of tomorrow; we find loving new homes for thousands of cats and we reunite lost cats with their relieved owners. We never put a healthy cat to sleep. We rely on the kind generosity of the public to make this possible. So, if you love cats, please make a donation today.